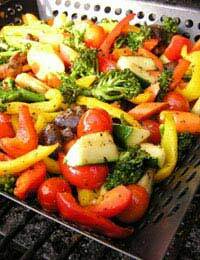 Even if you are not vegetarian roast vegetables are a tasty way to serve a dinner recipe. The choice of vegetables in unlimited and can vary according to the season, personal tastes and what it is accompanying. Seasonal root vegetables are ideal for roasting in one pan. Ensure that all vegetables are cut to a similar size otherwise some will be over cooked whilst others are still under cooked. Root vegetables will take longer to cook so if time is at a premium part boil them before draining and adding to a roasting pan. Drizzle with olive oil and place at the top of a hot oven. Turn after twenty minutes. New potatoes are very tasty when roasted with other vegetables but seem to need par boiling first. Old potatoes can be peeled and quartered and added with the other vegetables at the beginning of the roasting process. Some vegetables need to be added towards the end of the roasting process. Tomatoes, courgettes and mushrooms are examples of this. Add then around twenty minutes before the end of the cooking time and make sure they are well coated in the oil. Try peppers, courgettes, cherry tomatoes, leeks and carrots for a colourful display and a tasty version of roasted vegetables. Pierce the tomatoes so that they do not explode and can soak up any flavours that have been added to the vegetables. Although a good olive oil is ideal when roasting vegetables try some of the flavoured oils that are on the market. These can be garlic, lemon or herb based and make ideal store cupboard ingredients for spicing up a bland recipe. Herbs and spices again make a tasty addition to roast vegetables and can be added to accompany any meats being served at dinner. Rosemary in with the roasted vegetables would go well if serving lamb. Why not scatter cranberries into the vegetables ten minutes before serving if the recipe is accompanying turkey or any other poultry? Rather than chopping garlic cloves into the vegetables where it can burn or disappear try adding unpeeled garlic cloves instead. Either leave the cloves whole for dinner guests to squeeze out the soft garlic pulp themselves or do this yourself before serving. Place lemon wedges amongst the vegetable when roasting. When almost cooked squeeze some of the soft fruit juices over the vegetables and leave the rest for dinner guests to eat with their meal. Remember to remove any pips or thicker white pith as it will make the meal taste bitter. Roasted vegetables go very well with cold meats and can be served with the leftovers of a roasted joint. As these vegetables can be left to cook they can be served on Boxing Day with the remains of the turkey. The balsamic vinegar is very tasty on cold turkey slices. Either serve the vinegar separately in individual bowls for each dinner guest or sprinkle over the vegetables before serving. Balsamic vinegar is not like the usual malt vinegar that is traditionally served with fish and chips but has a fuller less acidic flavour. Encourage any of your guests who have never tasted balsamic vinegar to sample it as usually it is less likely to upset a person’s delicate stomach than the more common types of vinegar.